It's been nine long months but Formula One has arrived at the final destination of the 2013 season. As is right and proper, the Brazilian Grand Prix takes pride of place as the season closer, with the finale set to have a real party atmosphere as we wave goodbye to what has been an intense, if not classic, season of motor racing. The championships are all but decided, with most of the battles already fizzled out, so that this weekend all that matters is simply the joy of getting from lights to flag in style. Going into this weekend, there's not much at stake but pride. Sebastian Vettel aims to get his ninth race victory in a row - and everyone else aims to stop him. The German will also take his tally up to 13 race victories in a single, matching that other quite successful German champion. Heikki Kovalainen would no doubt like to score a championship point in one of his two races this year, whilst Mark Webber searches to go out on a high. The Australian is also within two points of fourth place, as Kimi Räikkönen drops down the order due to his absence. It wouldn't be Brazil without a spot of rain getting in on the action, and the forecasts suggest this year will not disappoint. So far, every single day of the weekend has rain forecast at some point - but whether it will directly affect the sessions or simply give us a damp track to play with, we will have to wait and see. This weekend, the double DRS is back in action - the first time we've seen two zones at Interlagos. The first is, quite naturally, detected just before the home straight and activated down just before the final kink to allow a good stretch of track for overtaking. The second is detected at turn two, with drivers having to round the left-hand bend of turn three before activating their rear wings down the long back straight. Those are the two straightest bits of track, but having two DRS zones so close to each other hasn't always paid dividends in the past. With high elevation changes and an anti-clockwise direction, the track throws in extra obstacles that the teams have avoided in the previous few races. The weather can play its part and the likelihood of a Safety Car making an appearance is high. By this point of the year, teams have already turned their attention to the next season and reliability issues can start to creep into the cars. 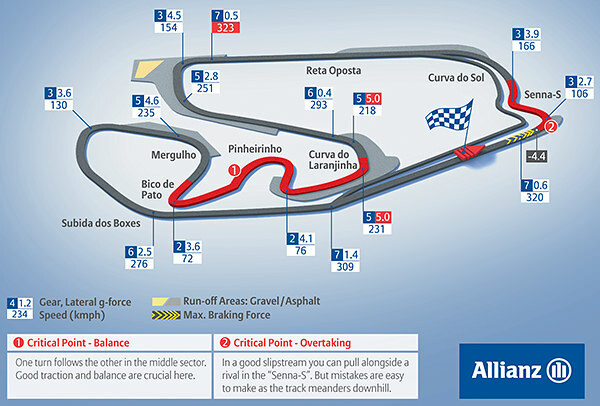 The Brazilian track has an instantly recognisable landscape. The circuit winds its way anti-clockwise along a bumpy stretch of tarmac that sits 800 metres above sea level. Some of the more delicate engines can react to changes in pressure at such a height, and extra compromises may be required to ensure top speed along the fast flowing track. The longest straight clocks in at almost 1.4 kilometres, and many of the corners are taken in 5th gear, creating a supremely fast lap. We've got the medium and hard compounds back in action this weekend, a similar selection to that on offer in the US. It also means the medium tyres have raced at every single event except Monaco. Busy compound! 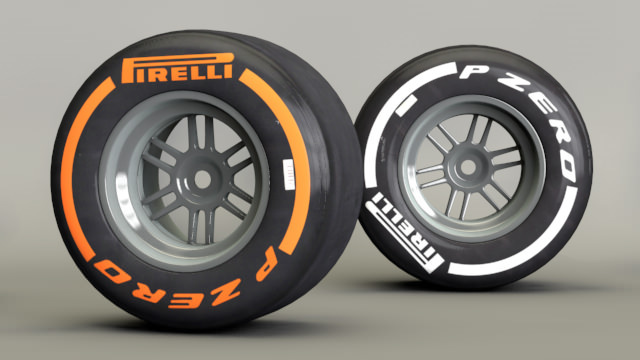 Teams will also get a chance to sample the 2014 compounds with Pirelli bringing some extra rubber for testing on Friday. Meanwhile, motorsport director at Pirelli, Paul Hembery, explains the issues with the track. There are a number of things to look out for in Brazil: despite being resurfaced a few years back the track is always quite bumpy, which makes it hard for the tyres to find traction and increases the physical demands on the drivers. Mark Blundell Former Formula One driver, CART racer and Le Mans 24 Hours winner.